Ants come in all sizes and shapes. 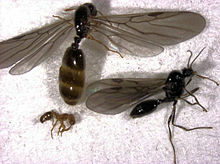 The most common types of Ants in and around Richmond, Virginia are Black and Red ﻿Ants. Keep reading to learn more about the life cycle of Ants, how they get into your house and why they keep coming back. 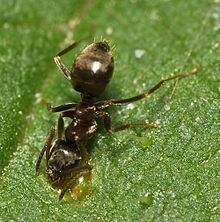 Ants are a part of the insect family "Formicidae." Bees and wasps are also in the same insect family, which is why you see similarities in colony structure between Ants and Bees. The queen's job is to lay as many eggs as possible, and they are very good at their job. 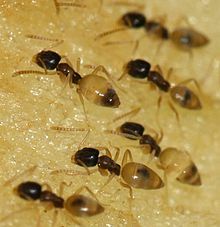 The workers' jobs are to bring back food to the queen and colony; make sure the eggs, larva and queen ant are cared for; and make sure the colony stays clean. Their sole job is to mate with the queen to keep producing eggs for the colony. 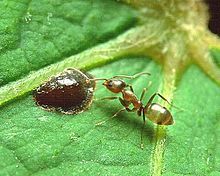 Ants are born from eggs, develop into larva, then into pupae and finally into an adult ant. Eggs are small, oval shaped and semi-transparent white in color. Larva hatch after a week or two of being an egg. They look very similar to grubs during this stage and spend most of their time eating so they can grow into the next stage of development: the pupae. The larva becomes a pupae after it sheds its skin. 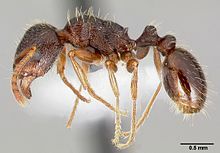 They look very similar to an adult ant at this point, except their little antenna and legs are pressed onto their body. Most of the time you will not see pupae outside of the colony. Where do ants live and how do they get into your house? 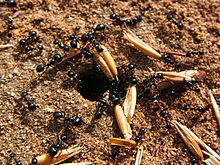 Ants can nest, or make colonies. Why do Ants love my kitchen? One word, SUGAR. 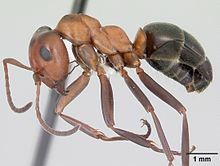 Virginia Ants are types of ants that love simple sugar, although some eat meat, birds, mammals, other inspects, spiders, and a plethora of other things. Ants have even been known to kill people in parts of the world! How do I get rid of ants in my kitchen (or anywhere else)? There are a lot of over the counter ant traps you can use to try to get rid of ants. 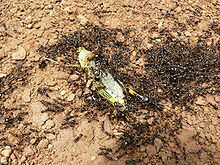 The ants carry food or poison from the trap back to their colony, which will slowly spread throughout the colony until they eventually die out. These traps actually work very well in the short term, but the ants can eventually come back, or a different colony will seize the opportunity. Also, with the wide variety of ants out there, one solution does not fit all. To get rid of ants for good you will need a professional and we would love for RVA Pest Control to be YOUR professional ant exterminator! Image credit - Wikipedia Commons. 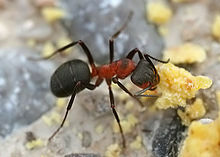 ​For information about Acrobat Ants, click here!